Color match is the first important element in the clothing tie-in, and so does home decorating, when you begin to considering for decorating you loved home, you should have a whole scheme for the color matching at the very start, by which to determine the main colors of home decorating, as well as furniture and home furnishings choosing. 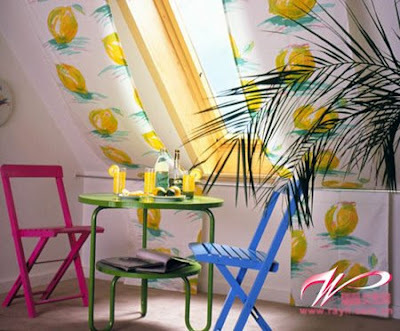 If you could control colors concordantly, you can ever dress your loved home at you pleasure more freely. Black together with white can create a strong visual impact, while added with gray which are very popular in recent years, which could ease the visual clashes produced by black and white, thus to create another type of flavors that different. The space integrated with these three colors full with cool feelings that represents modern and future, and in such a stimuli of color, reasonable, ordered and professional senses will occurred naturally from simplicity. In recent years "Zen" style is popular much, which advocates displaying original colors and pay attention to environmental protection, and show the natural feelings of linen, yarn, woven coconut materials with no colors color matching method, it is a very modern, natural and pristine style. In the color match mainly applied with blue and orange, can puts up convergence of modern and traditional, ancient and today, which collided visual feelings that contains both surreal and retro flavors. Color systems of blue and orange are initially belong to great contrasted colors, there only are some changes on both sides, so these two colors can bring the space a new life. In general, people at home will less dare to try too bold colors, they commonly considered that it is rather safe to using white color. If you prefer to use white, while afraid to make the home like a hospital, you’d better use white + blue, just a small island in Greece, on which all the houses are white, all ceilings, floorings and all the streets were painted white by lime, thus pale tonality showed. But the sky is light blue, the sea is dark blue, which puts up the coolness and flawless of white, such a type of white, make you felt very freely, as if it belongs to one part of the nature, being situated in, you will become open-minded, it seems the home space just like the sea sky, open and freely. To create such a Mediterranean style home conditions, you must put all furnishings in the home, such as furniture, home furnishings and curtains, etc. limited to a color system, and a unified sense could be produced only in this way. 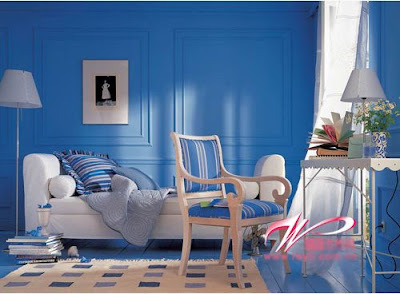 People who yearned for clear water and blue sky, white + blue are the best selection of color match for your home decoration and home design. At a living space relatively suit for young person, it is a very good color scheme with light yellow matched and purple blue or tender green. Light yellow is a fresh and tender color, which represents pleasure for new-borns, it is a best home color for families having a small baby. If green is a color that can make people calm and placid, which can ease the buoyant feelings of yellow, and make the space calm down more. Therefore, such a color match scheme is very suitable for young couples.